After the encouraging results of my first attempt to fix the composite signal from a C64, so that the cheap TFT monitor could display it, I shared the idea on Forum64 to double-check and get some feedback. Consensus seems to be that the circuit at least won’t hurt the video source. Since, in addition to that, it seems to be working for me, I decided to design a board for it in KiCAD. A couple of months ago I dug out my old Commodore hardware again and started tinkering with it – the goal being to finally try out a bunch of mods, hacks, and builds that I missed back in the day. 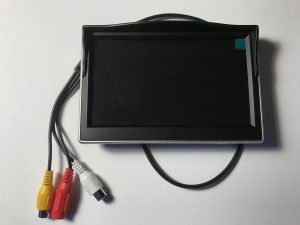 To start with, I bought a cheap TFT display for around 13€ to connect to the C64 and C128.